Posted on Sat, Jan 14, 2012 : 5:59 a.m.
University of Michigan President Mary Sue Coleman recently sent a video to students preparing them for what's ahead in the new year. At AnnArbor.com, oddly, the video got us thinking about the past. What was it like 100 years ago at the University of Michigan? Here's a peek provided by four images we found in the old Ann Arbor News archives and another image obtained from the Bentley Historical Library. 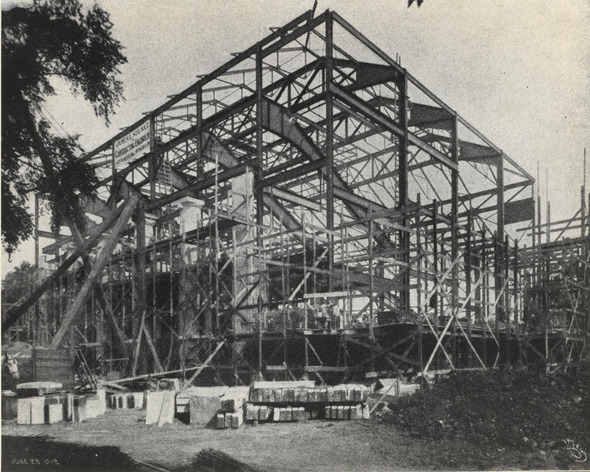 University of Michigan's Hill Auditorium during construction on June 25, 1912. In 1912 Hill Auditorium was in the midst of construction. One hundred years later, the auditorium remains one of the university's most popular venues for performances. In May, 2002, Hill Auditorium underwent an 18-month, $38.6-million dollar renovation. 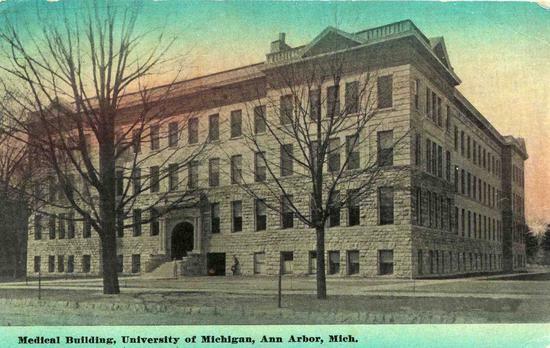 The University of Michigan Medical Building in 1912. Before there was the $754 million dollar C.S. Mott Children's Hospital and Von Voigtlander Women's Hospital and a vast medical campus contained in more than a dozen buildings, there was the U-M Medical Building, shown here on Oct. 1, 1912. The building, located on the Diag and now referred to as the Dana Building, is no longer used for medical purposes but houses the School of Natural Resources and Environment. Ann Arbor's Barton Dam was designed by a University of Michigan dean and constructed in 1912. Former U-M architecture dean Emil Lorch designed Ann Arbor's Barton Dam in 1912. The dam still exists today and is scheduled to receive a $1.15 million upgrade. The 1912 Michigan football team, led by coaching legend Fielding Yost, won five of seven games, including their match against Ohio State, which they won 14-0. That game, according to university records, was attended by 10,000 fans. As you might expect, frat boys dressed quite differently 100 years ago. 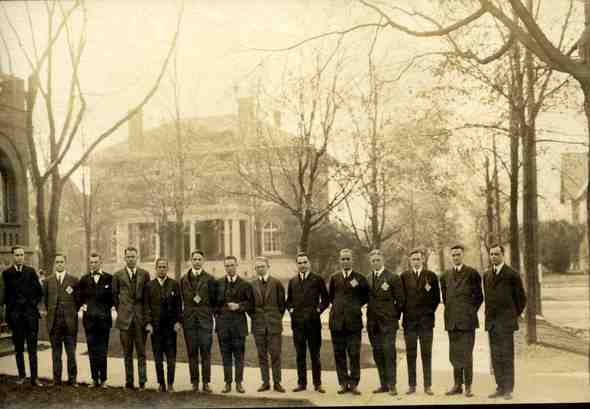 This image is dated between 1912 and 1916 and shows members of the Psi Upsilon Fraternity, which still exists today. Sun, Jan 15, 2012 : 9:41 p.m. Sat, Jan 14, 2012 : 6:34 p.m.
Great to see the highlights of buildings that have lasted 100 years, and are both useful and appreciated in our current environment. That's sustainability. Each project at UM and in the city should be approached with the idea of how it will function in 100 years to allow continued use, or re-use. Very good! Yes, a series like this would be great. It would be interesting to see a photo of the current Psi Upsilon members posed similarly for a &quot;centennial comparison.&quot; A number of people (like me) can be seen taking photos of buildings around town and on campus. (Thank goodness Homeland Security hasn't discovered us yet.) I'm trying to build an archive of such photos for my daughter and hopefully for her children. She grew up in Ann Arbor and has been amazed (when back home) at the new construction(s) which have sprung up over the past 5 years or so. Sat, Jan 14, 2012 : 5:01 p.m.
Q. About what year did the Med Students stop the practice of grave robbing/Body snatching? There was a television program on recently that outlined that practice while profiling serial killer Herman Webster Mudgett better known under the alias of Dr. Henry Howard Holmes. He graduated from the U of M Med School in 1884 and would resteal bodies from the labs but the bodies often were originally obtained by the students from fresh graves... Go Blue! Sat, Jan 14, 2012 : 4:39 p.m.
What was the salary of the dean who designed Barton Dam? Would any of today's millionaire deans make such a public service today? Great idea and great photos! Keep it up. Sat, Jan 14, 2012 : 2:32 p.m.
Any chance Annarbor.com could do a weekly series, maybe starting at the earliest date and going to current? Certainly a long endeavor to accomplish, but it would be great to see the history and evolution of our town. Sat, Jan 14, 2012 : 7:52 p.m. The Ann Arbor News used to have a regular column called Ann Arbor Yesterdays. But no, I think that there are so many newcomers who could care less about the history of the town, that it wouldn't be of much interest. I'm reminded of the discouraging remarks made by many when the Fifth Ave. homes were falling under the ax. Sat, Jan 14, 2012 : 12:52 p.m.
My thoughts: The football team went 5-2 but they beat Ohio. Whoo! It is good to see frat boys looking presentable rather than the dubstep listening party animals they appear to be now (if my Football Saturday morning impressions hold true the rest of the week). Sat, Jan 14, 2012 : 11:35 a.m. Awesome article! I love seeing glimpses of the past like this, especially when I'm so familiar with how they now look. It's also funny to think that 100 years ago they were putting up with some of the same constant construction headaches we whine about today. You see the results (such as Hill Aud) and it puts things in perspective. Which buildings (or underground structures, ahem) will people be raving about 100 tears from today? Sat, Jan 14, 2012 : 12:57 p.m.
No, no, considering the current administrations of the city and university, I think &quot;tears&quot; is apropos. Sat, Jan 14, 2012 : 11:37 a.m.
100 years... Sorry, posting from my iPhone.